Do you work in a job that requires you to stand all day? A job that requires you to sit only when taking a break or taking a leak? At the end of your shift, have your feet ached too much that you want to go home already and treat them? Maybe you're using the wrong insoles! Wearing the appropriate insoles based on your current situation will definitely alleviate the unwanted agony you're having now. Read along on this article to know the best insoles for standing all day. Workers working in a restaurant, department stores, assembly lines, doing guard duties are all at risk of developing foot and leg problems later. Because being on their feet is integrated into their job descriptions. Occasional sitting is no problem, but along these types of work, leisure sitting is not that tolerated among their management. Each year, millions of workers lose important days being absent from work because they are suffering from discomfort, fatigue, and pain associated with being on their feet. For instance, as a worker living on every paycheck, you don't want to be away from work if you have to. 1 What are these problems associated with your feet? 2 What causes these problems? 4 Have you chosen the best insoles for standing all day yet? 5 What can you do to prevent injuries related to standing aside from insoles? What are these problems associated with your feet? Before going to the focal idea of the article about what are the best insoles for standing all day, we must first know what problems you can get. The most common symptoms that are related to standing for extended periods of time are discomfort, fatigue, and pain in the legs. There are also many other risks attributed to it. Some of them are: developing plantar fasciitis (caused by stress on your plantar fascia), varicose veins, knee problems, restricted blood flow, lower back pain, tendinitis, muscle soreness, bunions, high blood pressure, pregnancy complications, etc. Other serious problems that would trigger are the worsening of an existing coronary heart disease, and venous insufficiency. Studies showed that pregnant women shouldn't be on their feet for more than three hours at a time. It is especially problematic for a pregnant woman to experience lower limb fatigue because this can cause complications to her offspring by reduced weight and premature delivery. Muscles are designed to support a human being upright. If they are made to maintain a position for a long time, muscles start to ache. Why so? Standing still reduces blood that flows to your muscles and puts a stop to the regular muscle movements that pump back blood from your feet to your heart. If blood can't flow properly, veins at the feet and legs get inflamed causing your muscles to ache. Moreover, when you suffer from pain in an area, your body compensates by reducing pressure on that area and adding more weight on the opposite parts of the feet that can cause spine misalignment plus back pains. Just wearing a good pair of shoes won't ease your discomfort. Because it is relatively difficult to find a pair that has the particular cushioning and support needed for your feet. The best alternative is the shoe inserts. Wearing a pair of high-quality insoles can really add comfort in your every step. Correct your poor posture that resulted from aching feet with insoles. If you're a first timer, insoles are those cushion covers that you put inside of your shoes securing your entire feet. All the stress you've accumulated would be gone, and you'll thank yourself later. Our list was generated from extensive research done on all the available products in the market. Be rest assured that the top ten best insoles for standing all day are listed here. This brand has been in the insole industry for a long time since 1977 and with good reason. Their reason: Because their insoles work for those, who stand all day. A perfect brand for first-time buyers, Superfeet is the perfect orthotic for everyday use and can be used in multiple shoes. You just have to take them out of the shoe you wore yesterday and slip them in the shoes you'll be wearing today. Are you having a problem with getting the right size? Don't worry because Superfeet is trim to fit orthotics, just use the original shoe inserts as a template. Superfeet takes pride in its design about the deep heel cup that cups your heel to protect it from shock. Also a pain reliever, it is an excellent support for your heel and even your back because of the shape that protects the major pressure points of your foot. It helps form proper bone alignment. This orthotics comes in different colors based on how high your arch is. The present colors are green, orange, and blue. Because it's not thick, this orthotics won't be a nuisance to your shoe because it won't be too tight. This brand is also heavy-duty for the reason that it last ages and doesn't lose its support. Albeit they are on the expensive side of the market, it is guaranteed that you'll be walking and standing pain-free. You'll get what you paid for. From the name itself, these are heavy duty insoles. Spenco is one brand among the few that is leading in the insole market industry. They have multiple products for every intended use. They are said to be very comfortable for long time use. Four materials are combined to make up the whole structure of the insoles. For the top layer, we have the green four-way stretch fabric that helps prevent blisters and an anti-microbial feature that keeps the moisture away. Next is the 5/32 inch Spencore black thing that is said to be anti-shock and very pliable, cushioning your heel. Around the Spencore is the polyurethane, a lightweight foam that provides arch and heel support. The bottommost part is the neoprene, a synthetic rubber that encompasses the whole of your stride. If you're on a budget, you can try your first insoles with Spenco. Powerstep offers heel to toe comfort thanks to their advanced technology. From their Amazon page, these insoles have shock absorbing gel that absorbs impact in your every step. The ComfortLast Cushioning Insoles offer controlled cushioning that is soft but maintains maximum support. Their contoured shape gives your heel more comfort to the whole form of your foot with arch support and heel cradle. Their advanced technology called Variable Cushioning Technology (VCT) foam has the ability to conform to an individual's foot over time. Perfect for people on their feet all day. This brand is for everyday use from standing, running, walking, etc. They are unique because of the metatarsal pad that is designed to reduce friction and prevent from forming blisters. The metatarsal pad also helps reduce discomfort caused by plantar fasciitis, Morton's neuroma, and metatarsalgia. Furthermore, the top cover is of Plazatazote material – that is a lightweight rubber that conforms to your feet for a good fit. It also helps relieve and protect your pressure points, definitely recommended to people diagnosed with diabetes and arthritis. The design of these insoles is also unique. It has cushioning pods (about Poron cellular urethane technology) that provide maximum shock absorption at the heel and forefoot. Aside from that, the pressure relief arch supports have molded channel to keep moisture at bay, ensuring dry feet. This model has good arch support and heel cradle that help support the foot and reorganize pressure. Like Superfeet, New Balance also has deep heel cup that is the heel's natural padding that adds extra cushion for comfort. They are easy to use. You can trim to fit them with your custom size and insert them to a pair of shoes. But these can be somewhat expensive for people who are on a strict budget. It's no wonder that this brand makes it to our list. Why, because Dr. Scholl's is one of the renowned insole brands that has been on the market for many decades. These insoles are skillfully designed for the workers that are on their all day long and are complaining about their aching feet. Despite being the insoles for the workers, you can also use these inserts in all shoe types for all activities you might have. They are made of rubber that conforms to your feet, and the blue cushions add support and more comfort. These insoles do not squeak, though they are made of rubber. Also, it has an anti-microbial feature that keeps your feet dry, away from smelling f﻿﻿ee﻿﻿t. Because of the shock absorption, these insoles can offer, you need not worry about standing all day long with Dr. Scholl! If you are looking for a great prevention against foot fatigue, then Dr. Foot’s Insoles might help you with its designed high arch support. Insoles with high arch support have a significant impact on the force your foot receives. Whether you have flat feet, high arch or low arch, this insole adapts to your foot structure. With its flexible and soft foam, you will experience an all-day comfort. Dr. Foot promises high-quality and medical grade insole through the use of Comfortable Absorbent Velvet Fabric and Durable Polyurethane Material.Dr. Foot asserts its Stoma Design which allows better air circulation. Stoma Design is the reason behind the anti-fatigue advantage. These materials together with its design make the insole act like a spring. 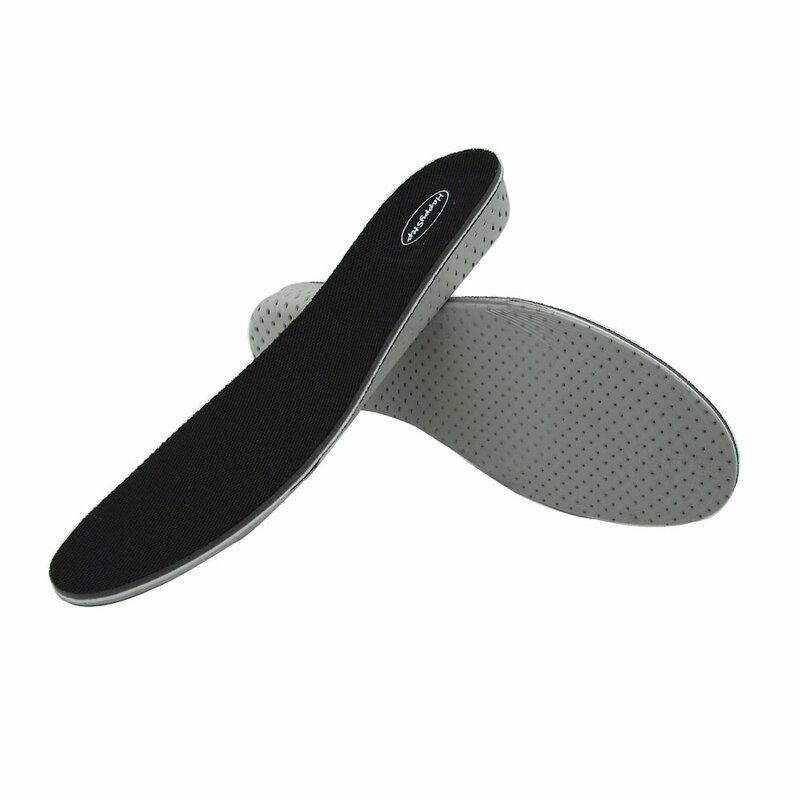 As you wear these insoles, your feet will experience the same feeling as it has been massaged. It is undeniably awesome for pain reduction. This insole is adaptable to your size and on the kind of shoes you have. Prepare your scissors as you may want to cut the insole to your size. Just look at the back of the insole and you will see a clear line referring to different shoe sizes. Dr. Foot ensures friendly customer service. You will get a 30-day money back guarantee if you are not satisfied with the insoles. Plus, you will get 12 months warranty for other issues. After-sales will never be your problem. HappyStep ensures its insoles to match your feet through the use of memory foams. This material contains polyurethane and other chemicals which promote viscosity and density. When memory foams have high density, it will mold itself to a warm body. Memory Foams are popular in the pillow and mattress industry due to its comfort advantage. Integrating it with this insole provides enlivening support and cushioning for your feet. The pain won’t be your problem anymore. 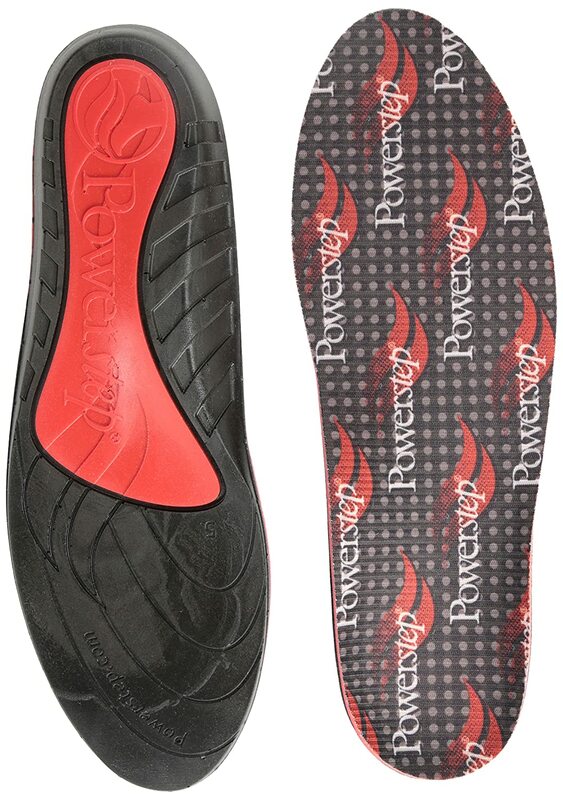 This insole features an ultra-light design. So you must not worry for notable additions to the weight of your shoes. Included in its design is a full arch shell to aid your motion and give stability to your shoes. It also follows the stoma design to ensure better air circulation. It is indeed comfortable and adaptable to your feet! HappyStep uses active carbon fibers for this insole. Active carbon significantly absorbs the odor of your shoes. Thus, you don’t need to worry about smelly feet after an all-day use. Regardless of your shoe size, HappyStep Memory Foam Insoles can accommodate you. The foam can be trimmed easily. Just prepare your scissors, cut it to your exact size, and experience the benefits of this insole right away. 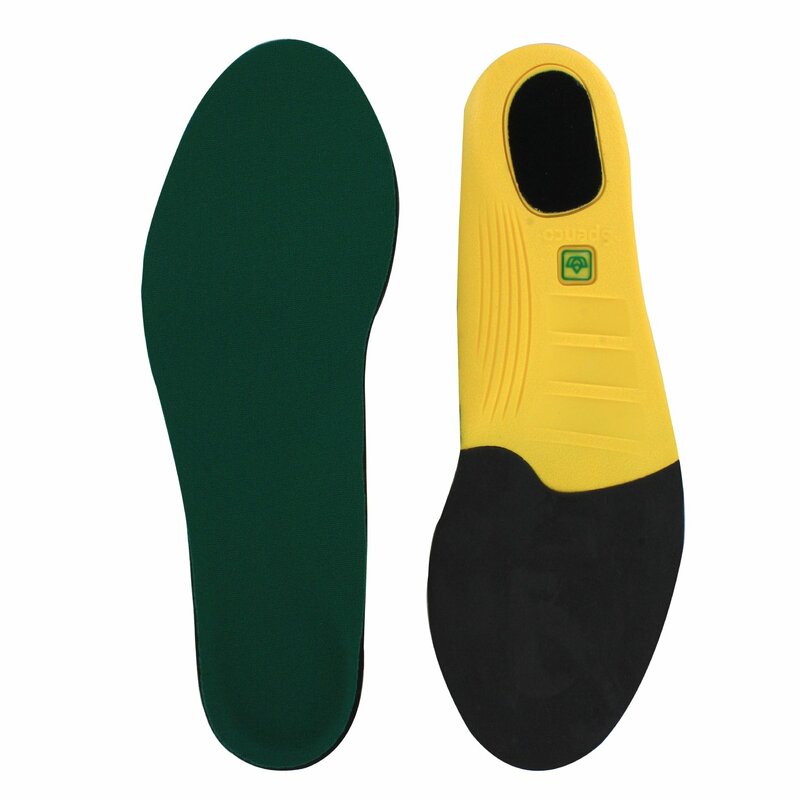 If performance and comfort of footwear are your concern, you might find this insole manufactured by Sof Sole preferable. Its neutral arch contour promotes suitability for most foot types and shoe types – ideal for walking, running, training, and other casual use including long-time standing. This insole is suitable for almost everyone as it can be trimmed to your shoe size. This sole is seamlessly adaptable and recommended for people with a flat foot. You don’t need to worry for irritating warmth and moistures on your feet as this insole integrates the moisture management treatment of Hydrologix. Also, its top cover has a treatment technology which obstructs the growth of odor-causing bacteria. Moisture-free and odor-free features, when combined, provides the remarkable comfort you absolutely need! With the addition of its gel pads providing more cushioning for your heel and forefoot, your feet will never experience the usual fatigue obtained from your ordinary insoles. This insole is produced with IMPLUS foam. Accompanying the gel pads, it produces incomparable shock absorption. This will surely extend the physical limits your feet experience. This insole is made with synthetic materials. It also uses quality materials that will last for a long time under normal use. With a one-year warranty, this will certainly become your feet’s long-time buddy. Since 1973, Timberland PRO remains a global leader when it comes to design, engineering, and marketing of high-end footwear. They set industrial standards regarding craftsmanship, durability, and protection. Sustainability and environmental campaign inspire the company to use recycled materials for its products. 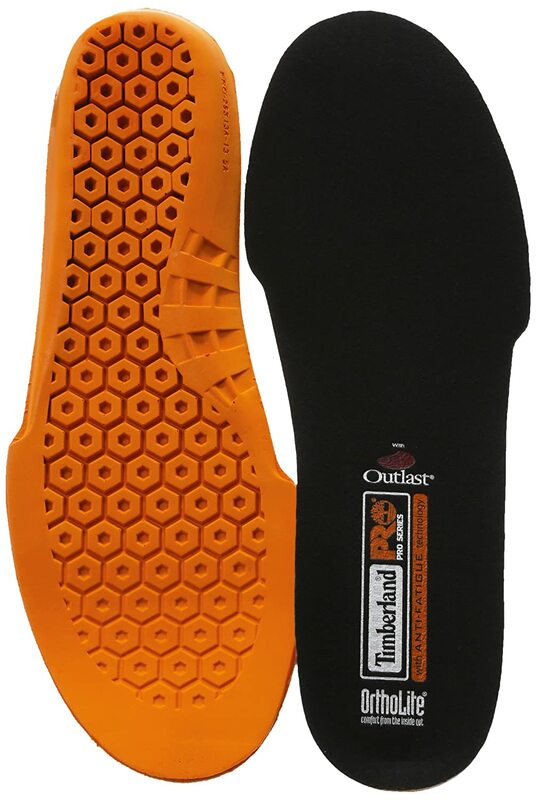 You must never despise recycled materials as it can still stimulate high-quality products such as this Anti-Fatigue Technology Insole produced by Timberland PRO. The inverted cone design makes this insole unique apart from other marketed insoles. It is anatomically contoured which provides a framework for maximum comfort and support for your feet. This was made possible through their dynamic arch design, making it suitable for all foot shapes. Quality is assured with this product through the use of leather and synthetic sole. It promotes anti-fatigue technology to help you stand for a long time. It uses the OrthoLite’s polyurethane formula with recycled rubber on its top layer to ensure long-term cushioning, high-level breathability, moisture management, and antimicrobial function. With these features in mind, this insole still remains to be lightweight. Weight addition continues to be unnoticeable. The performance of this insole remains at optimum even if you wash this along with your regular use. After washing, expect like you have a newly bought insole! This insole made by SOLE Softec brags with its Seal of Acceptance by American Podiatric Medical Association (APMA). When a product has Seal of Acceptance from APMA, it has been found to promote good health for the feet. 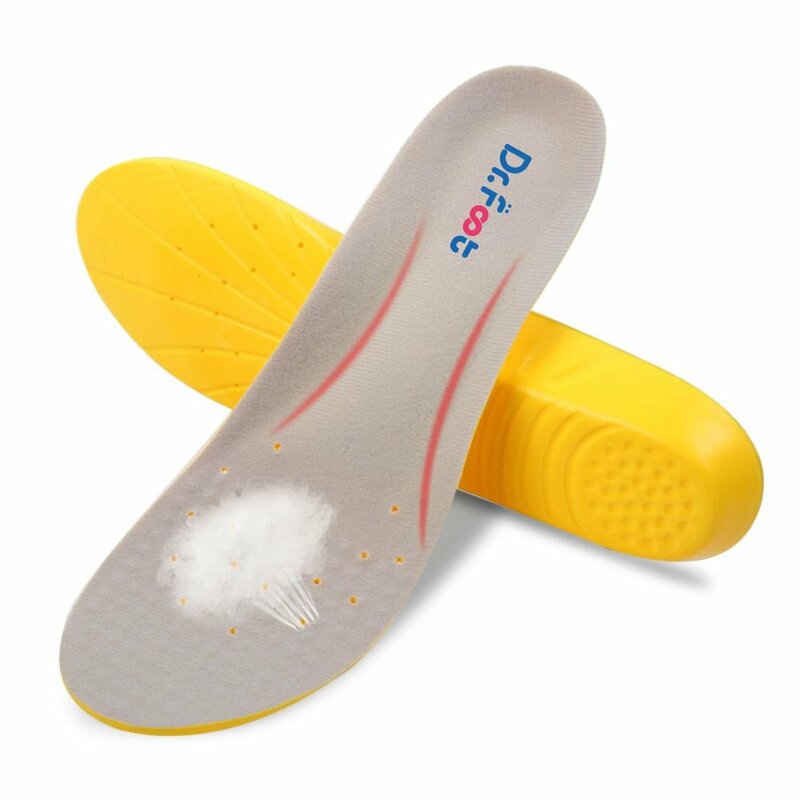 With this in mind, you are assured to obtain a quality insole upon purchase.If you have flat feet, bunions, back and knee pain, this insole might help relieve the pain and sores you have right now. SOLE asserts that this product only uses synthetic materials. It has no animal products or byproducts. That must have relieved you if you are an animal rights advocate. 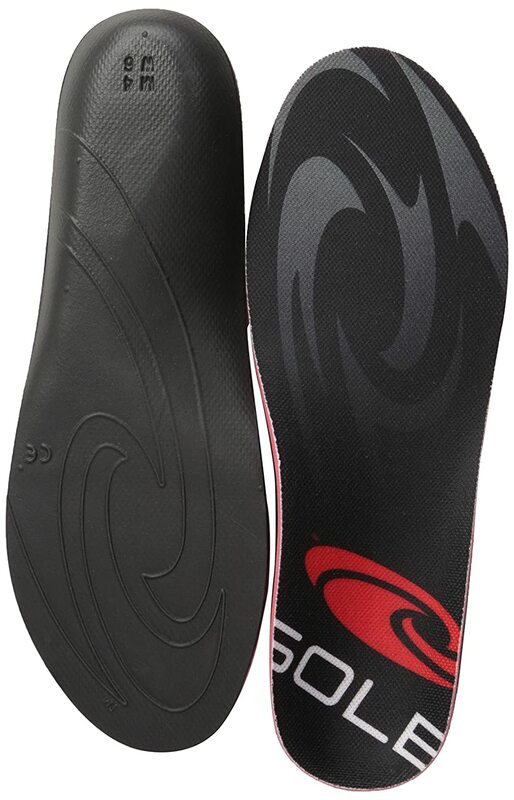 This insole uses an open-cell cushion measuring 3.2mm layer, branded as Softec. This ensures maximum thickness, especially for loose footwears. Regardless of its thickness, shock absorption is highly promoted with this material. Also, it uses a high-density Ethylene Vinyl Acetate (EVA) foam which has been contoured for integrity and support. Contrary to the weak and flimsy low-density EVA, the higher density EVA makes this insole quite strong, supportive and long-lasting. Additionally, your feet will experience extreme comfort with this insole because the high-density EVA is not hard and shocking to the feet, as opposed to a plastic material. You have the option to bake the insoles to obtain a custom mold for your feet right away. Instructions are included in the kit. Have you chosen the best insoles for standing all day yet? Before finalizing your selected product, do check with these guidelines. What arch type do you have? Do you have foot conditions like flat feet or plantar fasciitis? What type of day activity do you do? Which part of your foot do you feel discomfort? As for the last question, for a first-time buyer like you, you are forgiven if you don't start with the expensive products right off the bat. Maybe you can find what is suited for you on the cheap side of the market. However, we're not discouraging you to avoid the expensive insoles. You can always go for them as the common outset is if it's expensive then it's high quality, right? Maybe you can get what you paid for. Remember that the best insoles should have these characteristics. If they don't have them, consider other products. But be assured that our list has all of these! What can you do to prevent injuries related to standing aside from insoles? Did you know that you can do alternatives along with wearing the best insoles for standing all day? You can reduce the risks of sustaining foot conditions with these simple actions while you're wearing your good insoles. Not going for a pair of best insoles for standing all day may take a toll on your feet. Shoe manufacturers' ready-made insoles just don't cut out for making your feet comfortable while standing. You must buy orthotics designed for alleviating discomfort and have other necessary qualities stated above.